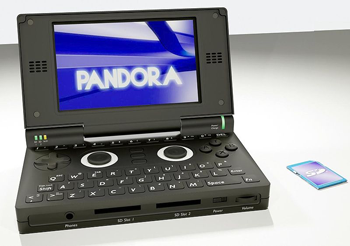 The OpenPandora project has created a Linux-based hand-held intended for hacking, gaming, and for use as an ultra-portable desktop. The ARM-based OpenPandora platform features OpenGL ES--the mobile version of the OpenGL 3D graphics API--and is capable of powering real-time 3D games similar to what might be found on the Nintendo DS or Playstation Portable. The OpenPandora device has the traditional D-Pad for navigation, as well as a touchscreen, two analog thumb-sticks, and a "QWERTY" keyboard, making it ideal for developing a wide variety of mobile games. The release of the OpenPandora device has been delayed several times since OpenPandora began taking orders in 2008, but recently parts have begun arriving for assembly in the United States, and the first orders should be shipped shortly. Since the OpenPandora handheld is designed as an open platform, it's possible for developers to build apps for it without having a physical device, but those working on "homebrew" games for the platform will have their first chance to have their projects played on the Pandora hardware (and on-the-go) soon! For more, check out the OpenPandora Developer Blog.